It's official. We've moved to 326 E Tyler St, Richardson, TX 75081. As of last Friday, March 29, our new neighborhood is called Highland Terrace, a wonderful mixture of ages, ethnicities, and economic and social statuses. Our across-the-street neighbor is a lovely artist; there's a very cool lowrider Cadillac parked out front a block away; the 33-year-old headmaster of Providence School in Dallas lives a few houses east of us; our neighbor to the west is the Richardson Police Department; and the Lairds' house is a ten-minute walk! Getting moved into our new home hasn't been easy. Leslie sent me a meme a few days ago that says moving is one of the five most stressful experiences in life. I can confirm this to be true. We spent much of March packing (by "we," I mean mostly Leslie and our daughter Mary). The movers came last Saturday morning at 9am, and for the next twelve hours we moved, hauled, dragged, abandoned, and (at times) despaired. Leslie and I seldom argue, but on Saturday night, we argued...big time! Now, three days in, we are starting to see a tiny light at the distant end of the long, dark tunnel. Our bedroom is unpacked and calm—and that's been a huge blessing! We've slept well, and with a bit of rest our arguing has entirely passed, replaced at various times with exhaustion, resignation, and (most recently) renewed hope. This is great news for me, because honestly I am no good at all when Leslie and I aren't on the same page. Now we are! To explain some of our stress, you've got to understand we just downsized by almost 45%. That means we've had to comb through decades of stuff and get rid of a lot. A lot! For instance, I had to sell or give away 25 boxes of books! Do you have any idea how hard that is for a bibliophile like me? I parted with books that I have had since I was a child. But, when downsizing, what else can you do with an Encyclopedia Brittanica, Junior Edition, circa 1965? It's been out of date for 50 years! And then there's the kids' memorabilia! Oh my goodness, we had to sort through 27 years of toys, photos, home-made crafts, notebooks, diaries, newspaper clippings, certificates, articles of clothing, blankets, etc, etc. Everything any of our five kids ever created, interacted with, or just touched once, had to be sorted and either stored or trashed. There were tears! By me and Leslie! The kids themselves were annoyingly eager for us to get rid of their old McDonalds Happy Meal toys! In terms of making our move as bearable as possible, many people have helped us. Three people stand out in particular: Brian Laird, Mary Lovell, and Will Grover. Brian has done everything that involved turning off water or electricity, or risking life and limb. Thank you! Mary put in more hours than anybody sorting, cleaning and packing. Thank you! And Will Grover gave up a whole day to help me move dozens of shelving units and contents for our garage. Thank you! Thank you all! Of course, the one to whom we owe most thanks is, as always, the sovereign Lord. We thank him for 22 wonderful years at 14527 Meandering Way; we thank him for letting us find this lovely new home, in our price range and located exactly where we had hoped; we thank him for strength to get the things done we've needed to get done; we thank him for allowing us to see our limitations; and we thank him for healing and restoration and new blessings every morning. One final comment: our hope is that, in our new home, we will be able to extend hospitality in Christ's name to our new neighbors, to our growing church family, and to the other people God graciously puts in our path. If things go as expected, we're hoping to begin by inviting all of you to a house-warming within the next few months. Watch for details. Know now, the only house-warming present we want is you! 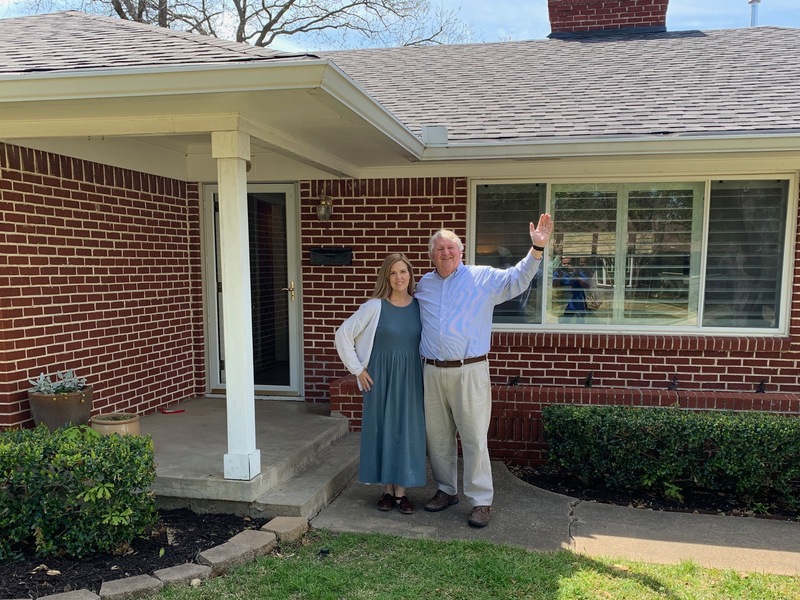 The name on the deed of 326 E Tyler St (if you don't count the mortgage company) says William & Leslie Lovell, but Leslie and I are both crystal clear that this house belongs to the Lord. The house he has generously given to us, we have humbly given back to him, with our gratitude! Our prayer is that, while we live here, God's name and his Son's name, in the name of his Spirit, will be glorified and praised!